Thank you for a most fantastic leg again! This was my third trip with Leon. 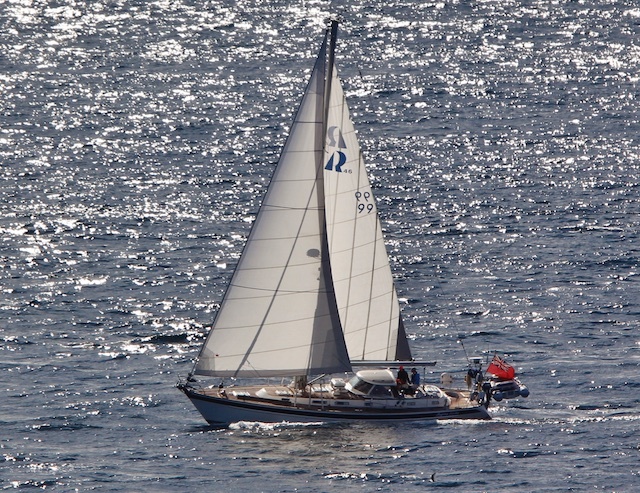 Last year, I sailed a long leg from England to Spain, crossing the Bay of Biscay. This was a truly fantastic experience. This year, however, I wanted to do something else. I love adventure and this trip turned out to be fantastic, In every way over expectations. 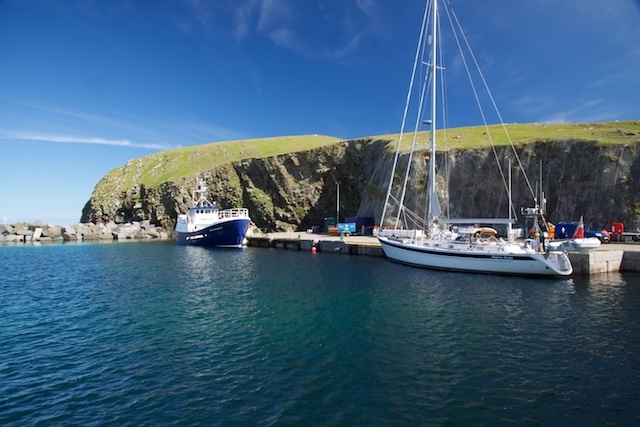 I feel very grateful that I got to see the Scottish Highlands from the sea and sail with a really nice crew up north to the Northern Isles! 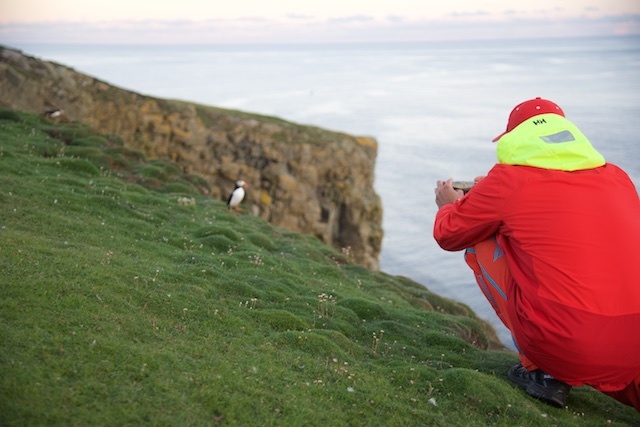 Out of everything, there was one outstanding thing: to visit Fair Isle was definitely the highlight for me! 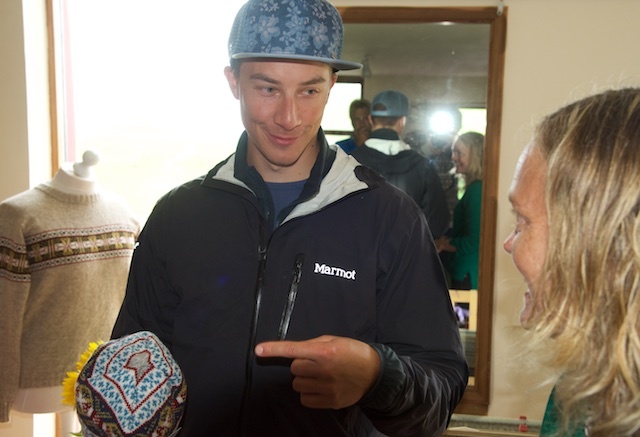 I will never forget Fair Isle! As soon as we had locked out into the North Sea from Inverness, I was immediately reminded of my job! Of course, all my crew-mates wanted to know EVERYTHING how it is to work as an specialist engineer on an oil platform in the North Sea! 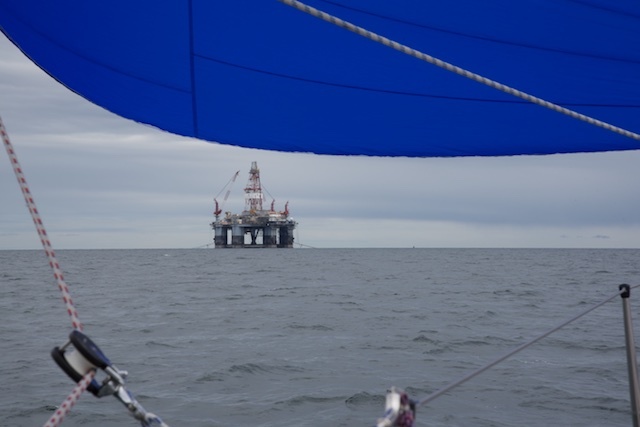 Great cool sailing over the Pentland Firth to Orkney. And I didn’t even get seasick thanks to the Scopoderm Plaster I had behind my ear. 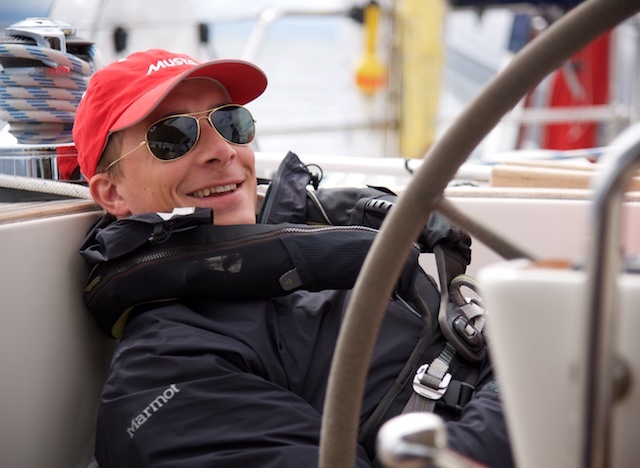 This is really a great drug that has changed my life at sea! 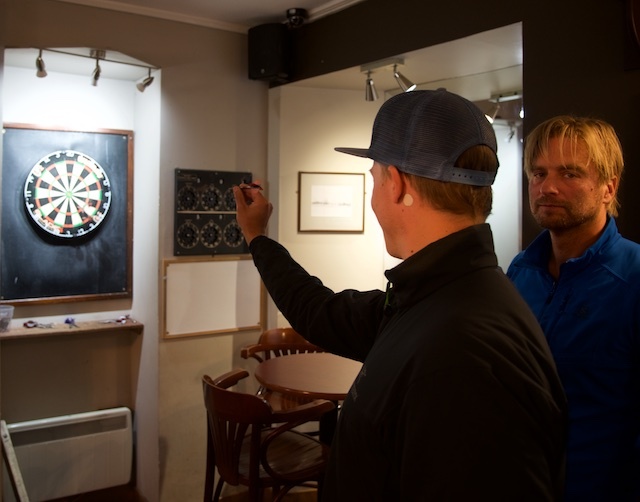 Playing dart at a pub in Kirkwall, Orkney. There are a lot less cooler places on earth to play dart! 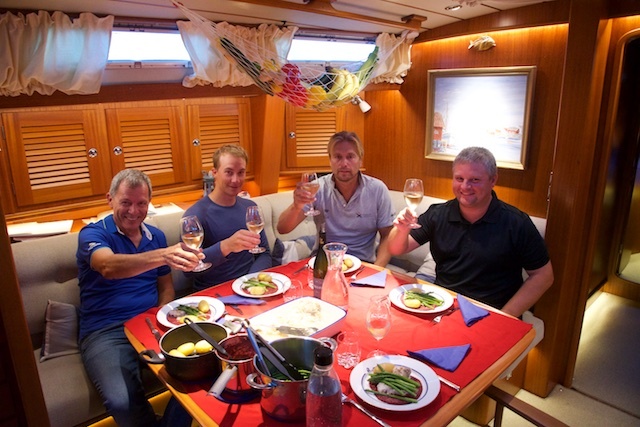 One of the cozy dinners onboard Regina Laska with my fellow crew: Gerd, myself, Mattias and Kristian! 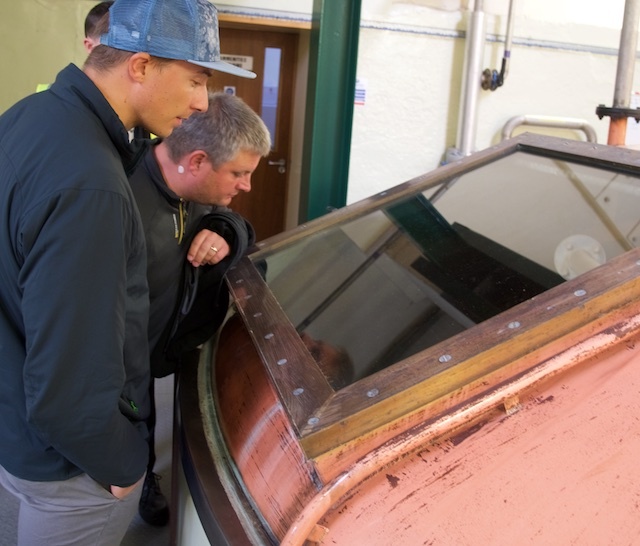 Whisky tasting at the Scapa Distillery. We all bought a couple of bottles each, but felt a bit cheated when we saw the same bottle 2 GBP less expensive at the local Tesco store (and even less expensive at the Lerwick airport). Bit at least we know we bought it at its source! 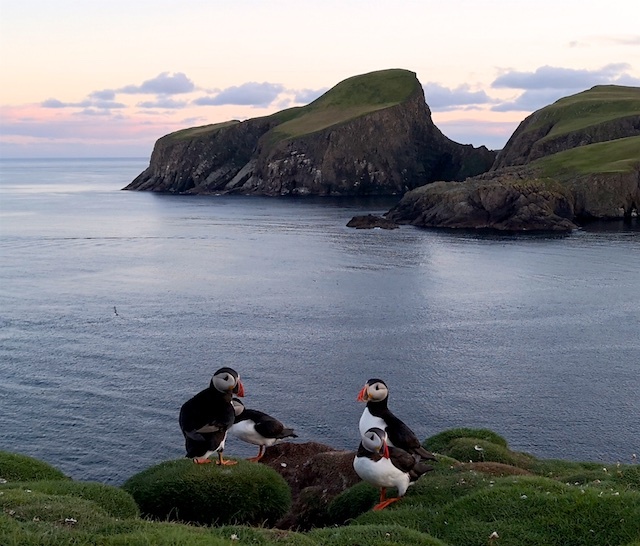 Regina Laska has arrived in Fair Isle, which turned into my Favourite Island! 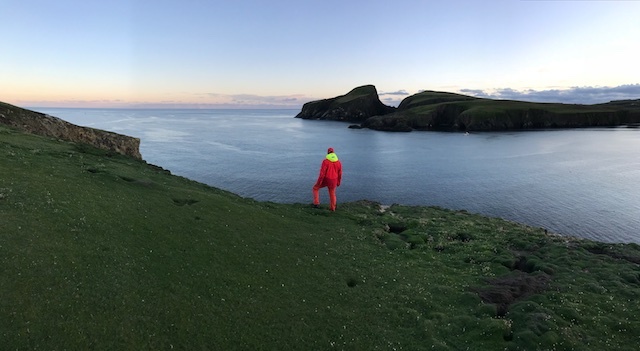 Going for a walk on Fair Isle the first evening. This became my favourite island, no doubt! I definitely wish to come back here one day! This is such a cool island on the edge of the Atlantic!!! I can go a long way to get that perfect shot with my cell phone! Here the following day at the north lighthouse. 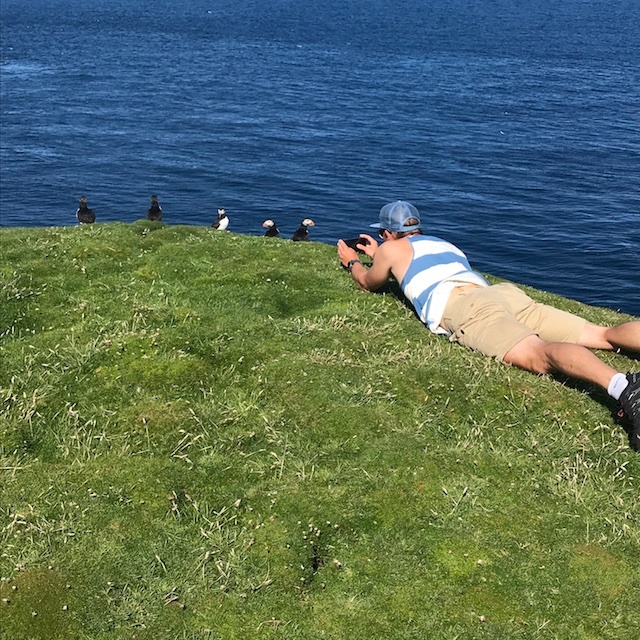 The photos I took on puffins with my Huawai cell phone! Incredible quality; taken with a Huawai cell phone!! This is my favourite shot. Also taken with my Huawai cell phone. 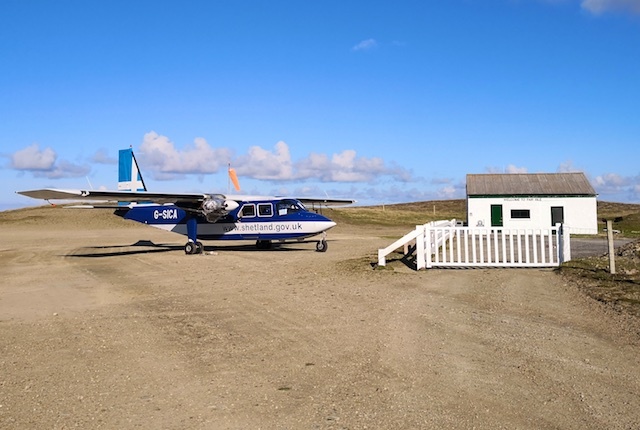 Mattias and I jogged up to the Fair Isle airport. The airplane was grounded with one broken engine. Prognosis for a soon departure does not look promising…. No passengers in sight at the gate or in the tax free shop or in the business lounge. 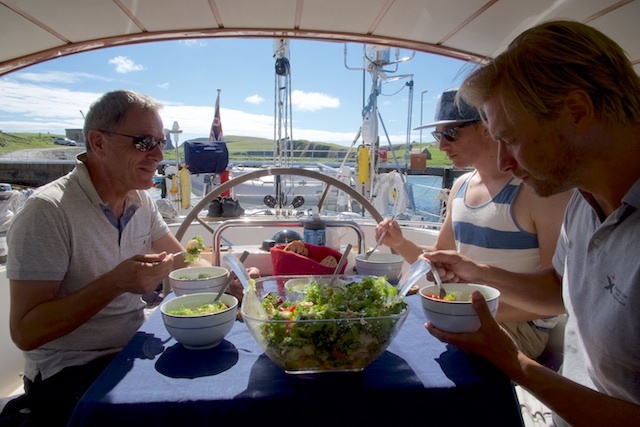 Salad for lunch at Fair Isle. Note the beautiful weather! 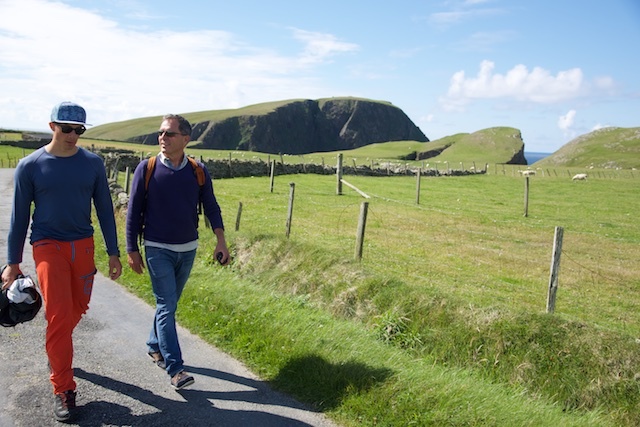 Arriving at Hollie’s home and studio, where the traditional Fair Isles are hand made. I knit myself as a hobby, so it was great to meet Hollie and discuss her Fair Isle knitting. And I can testify: This is a really high art of manual work! I adore Hollie’s enthusiasm, lobbying for the TRUE Fair Isles and her carrying on this old tradition. 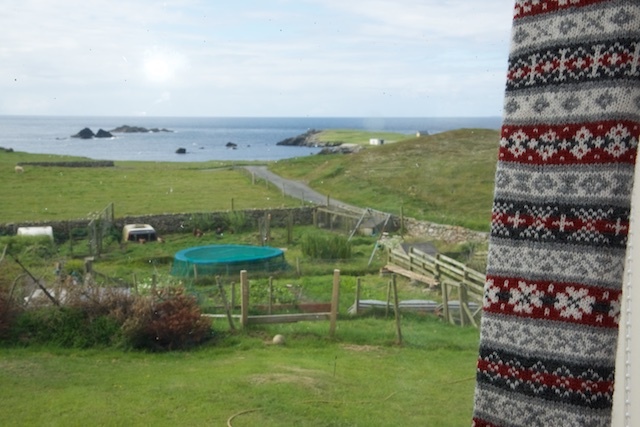 If there is anything I wish to spend money on, it is to support this fantastic community of 57 people living on Fair Isle, producing the famous sweaters bearing the name of the island! When I looked out of Hollies window from her studio and saw the sample she had hung up in the window, I couldn’t refrain from totally falling in love with the pattern and colours! I just had to order a true Fair Isle from Hollie! Never mind the waiting time is 3 years! These will be fantastic years waiting for my own handmade original Fair Isle: Never more than three colours in total; never more than two colour in one row; never a repeat of the pattern! It was like an spark crackling between Hollie and me. My sweater will forever be connected to Hollie and this fantastic island! I will take care of it and keep it for decades. 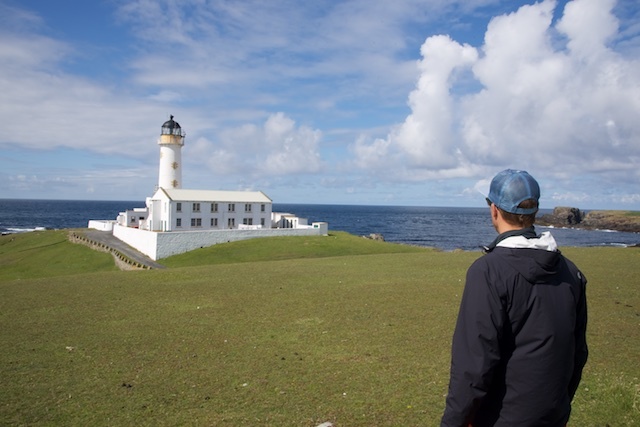 The southern light house on Fair Isle is situated not far from Hollie’s home. As the golfer I am, I thought it was fantastic to see this highly original golf course. 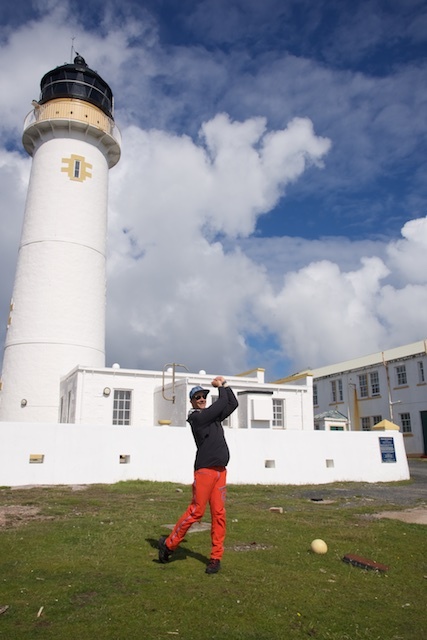 When the light house keepers had their free time, they used to go out and play golf in the nature. The holes looked like puffin holes. I recognised this as a golf course thanks to the red and yellow tee boxes as well as the sticks with some cloth on top acting as a flag here and there, stuck in the said holes, which were spread over the surrounding nature. It’s still a golf course one can play on! 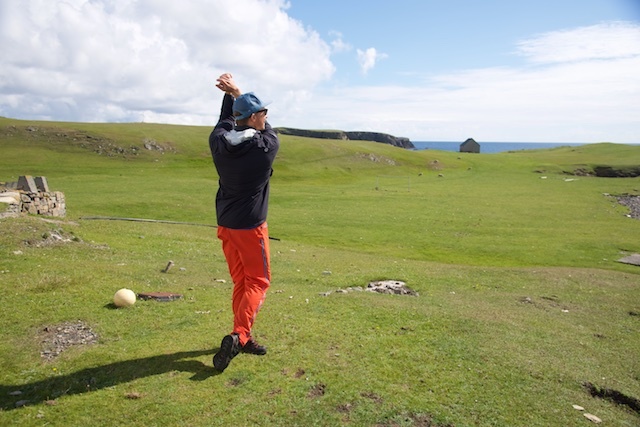 The most remote golf course, for sure! 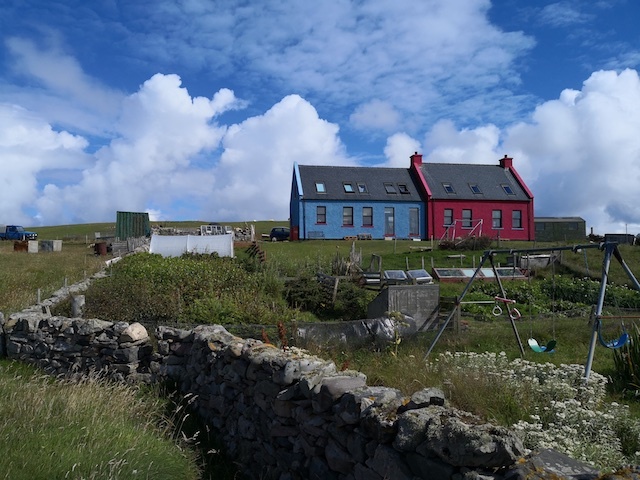 Placed on an island between the North Sea and the Atlantic with no more than 57 inhabitants. Next time, I’ll bring my golf clubs! Sheep were never far away. 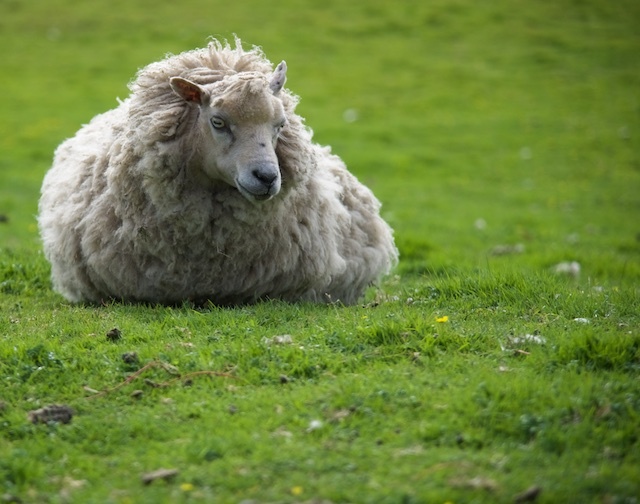 Will one of these cary the wool for my new sweater? 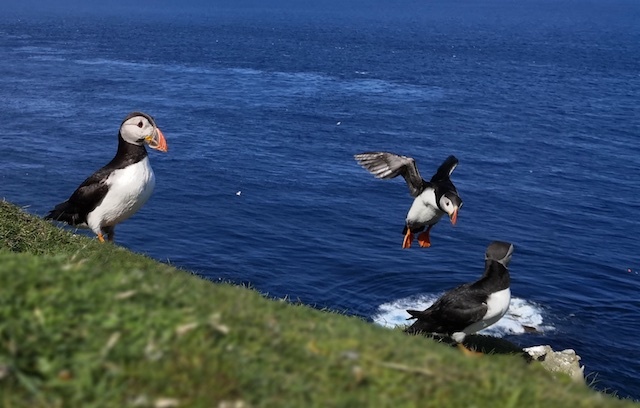 More funny animals on Fair Isle. 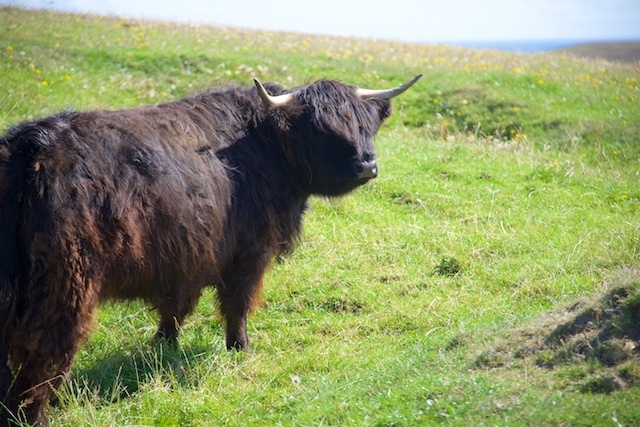 I believe these are called Highland Cattle? 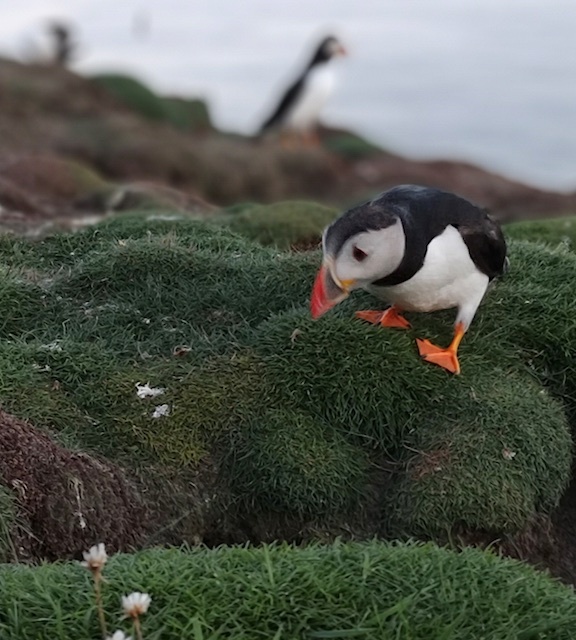 Walking on Fair Isle. Always up to an interesting discussion with the crew. Here, walking with Gerd, who had great stories to share form his life! 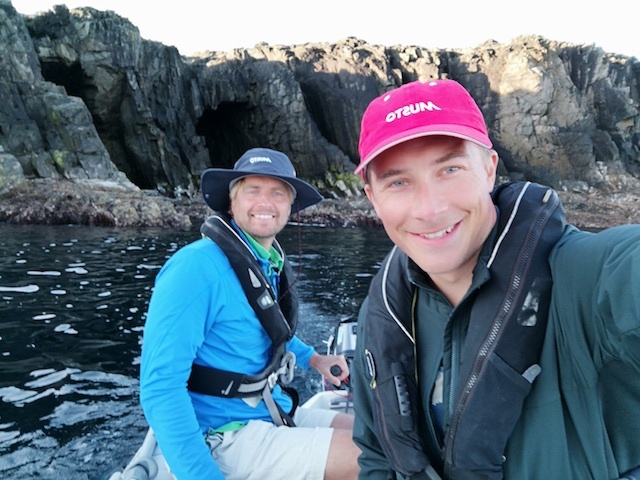 Taking the dinghy with Mattias going for cave exploration on Fair Isle. 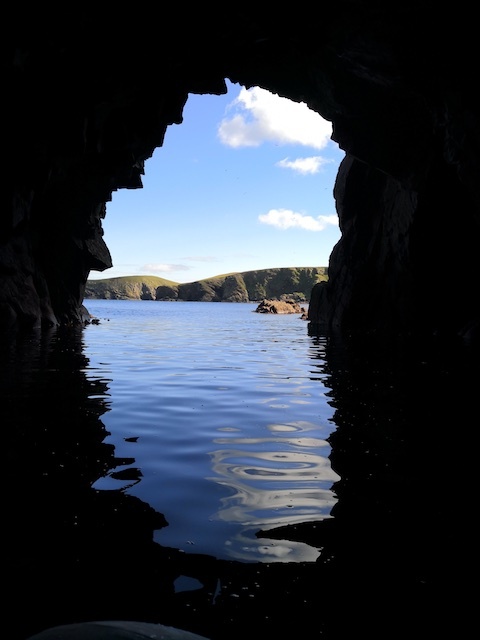 Inside one of the many cool caves with the dinghy. 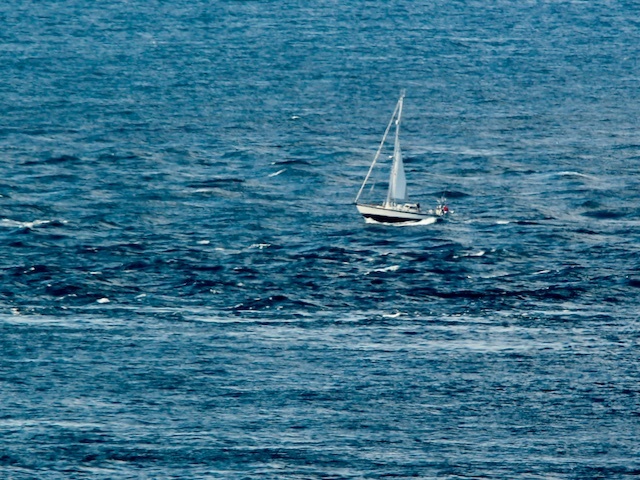 Beware: This can only be done in totally calm weather with no swell. We were very lucky, here! 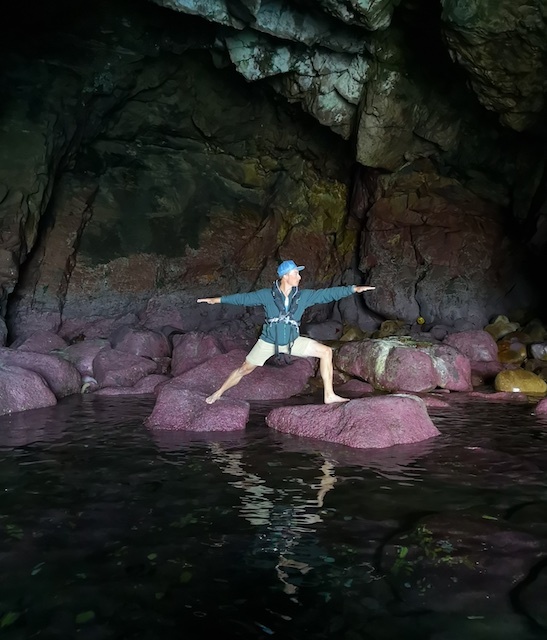 Me doing Yoga inside a cave! 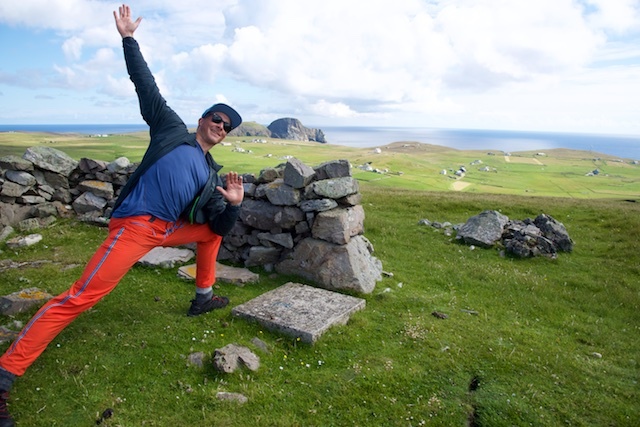 Is there a cooler place on earth to do Yoga, than on Fair Isle?! 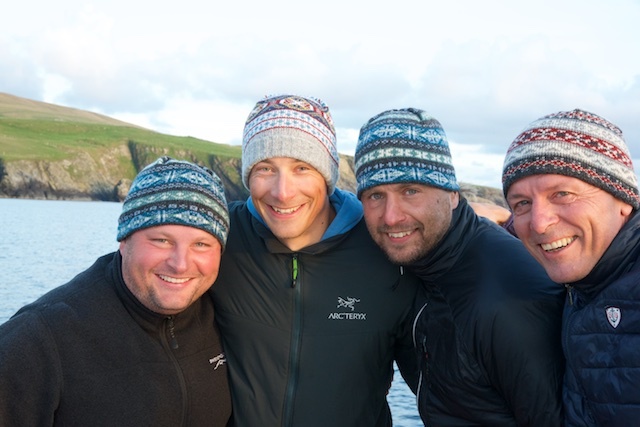 The crew of leg 10-2019: Niklas, me, Mattias and Gerd with a hat each we bought from Hollie. 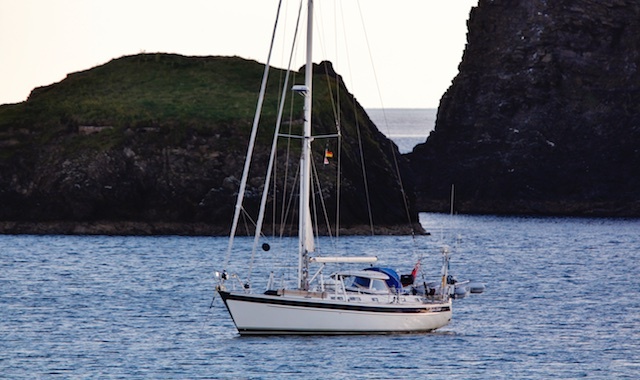 Anchored in St Ninian’s Bay on the west coast of Shetland. 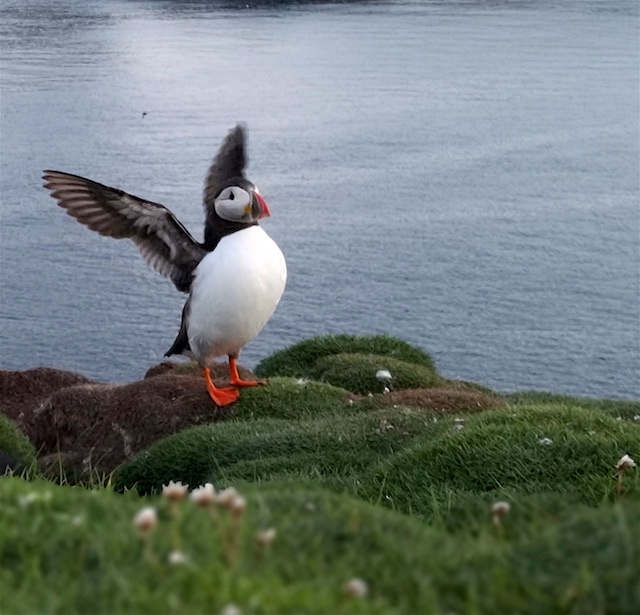 Photo by Ronnie Robertson, Shetland. 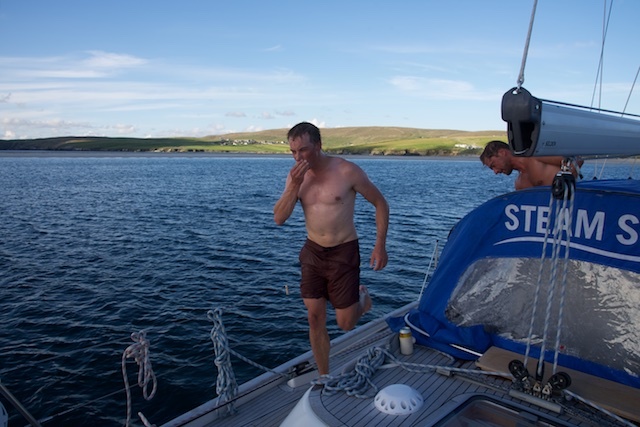 In St Ninian’s Bay we put up the sauna and were wonderfully warmed up after a chilly day at sea. What a treat! 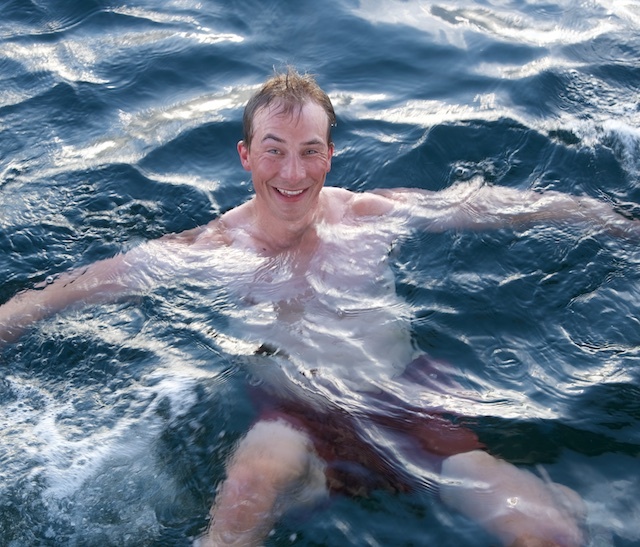 The smile may betray: It’s no more than 13 degrees C in the water! But I have viking blood, after all… and after the sauna, it felt refreshing! N.B. We all went into the sea! 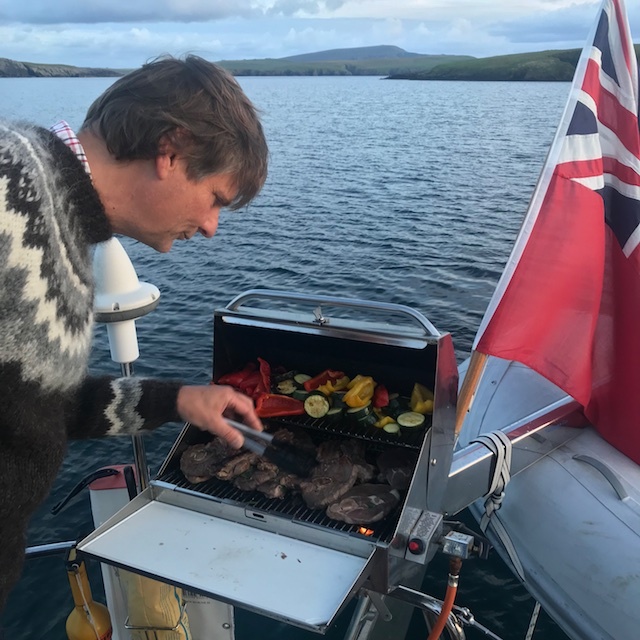 After the sauna, Leon put on the BBQ and was grilling lamb he had marinated during the day. 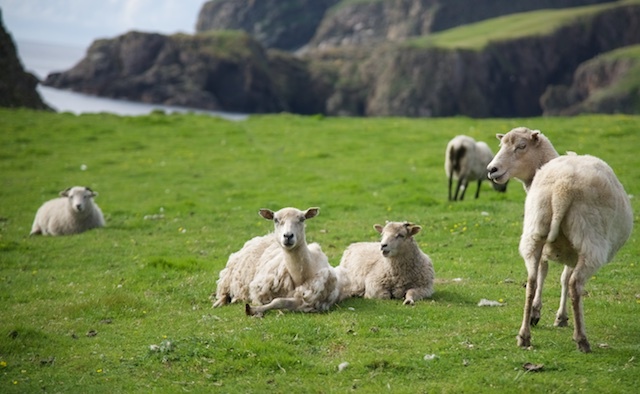 No sweaters from these lambs, unfortunately! 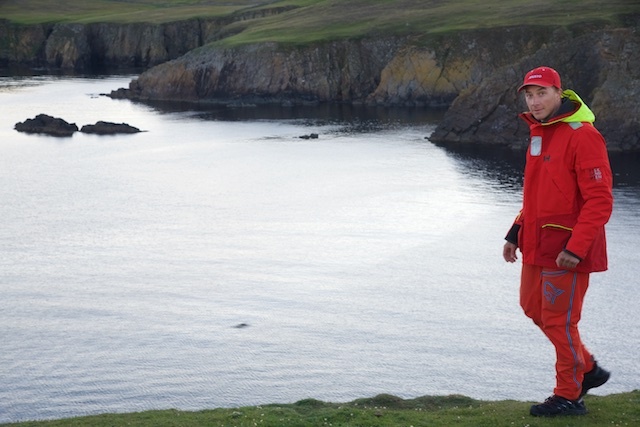 Our last day we rounded Sumburgh Head (the southern-most tip of Shetland). 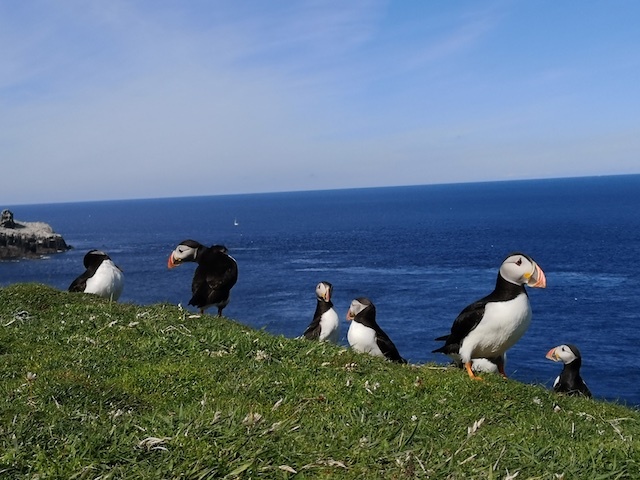 This notorious stretch of sea is called Sumburgh Roost. 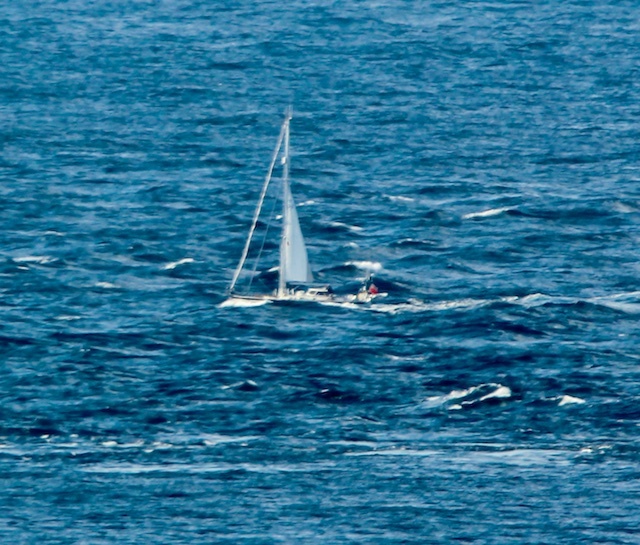 One can see that we had to fight quite some waves, despite rounding under really favourable conditions with hardly any wind from the east. 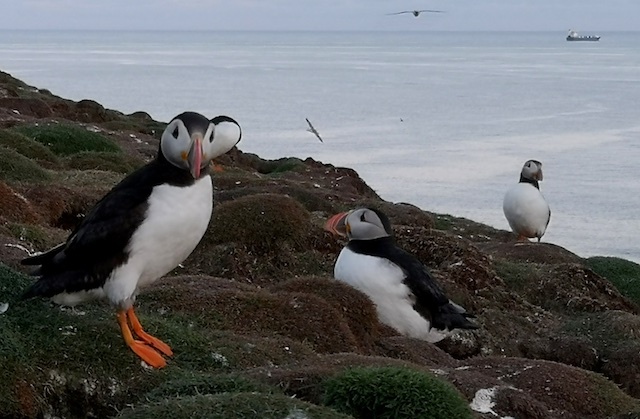 Photo by Ronnie Robertson, Shetland. 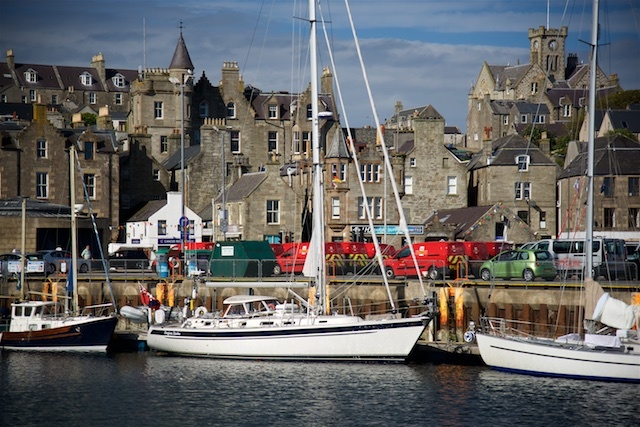 Sailing up towards our final destination Lerwick, the home port of Regina Laska. Photo by Ronnie Robertson. Regina Laska berthed in her home port Lerwick, Shetland. 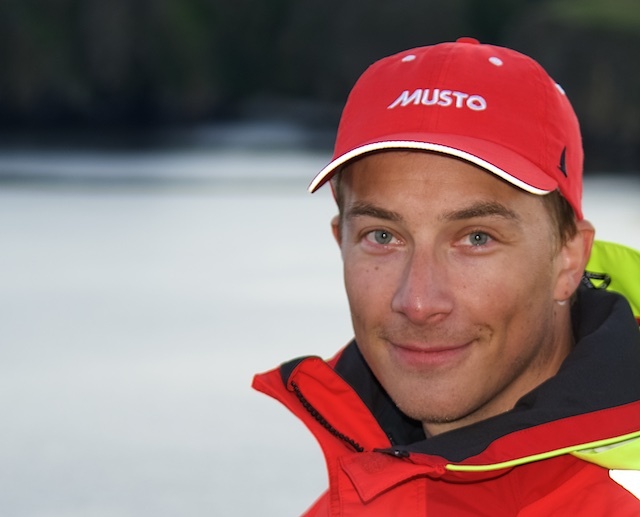 Filip Nicklasson, Sweden/Norway, sailing leg 10-2018 from Inverness via Orkney and Fair Isle to Lerwick, Shetlands.